Deuteronomy 4:12"Then the YHWH spoke to you from the midst of the fire; you heard the SOUND of WORDS, but you saw no form --only a VOICE. Yochanan 4:24"Elohim is spirit, F54 and those who worship Him must worship in R206 spirit and truth." Scripture gave a clear cut description that YHWH Elohim is a Spirit does not have a form, any one claim that Yahweh is an alien or a person or reptile looking being or any form of fly saucer are speaking against the scriptures. He is the same yesterday, today and forever (see Heb. 13:8). The modern Hebrew is written as the word "at" (et) (Barasheet 1:1 / Gen 1:1), In Greek is Alpha n Omega (Rev 1:8; ! :1; 21:6; 22:13) does not give much explanation of the meaning, The Hebrew gives us much understanding Behold, Hinnei the beginning and the end. YUH is the WORD numerical 10, TEACH, to instruct, the Comforter, the hand - Yad, possess the feminine in attribute "Mother"; Chokmah (wisdom) to convict all those who transgress the TORAH, soul of the TORAH; the breath of life, HaChayim (life), tree of life, HaEmes (truth),The word that breath into our life. The Yuh is the living Torah or Ruach HaKodesh. In Yochanan / John tells us that "In the beginning was the Word and the Word was with Elohim and Word was Elohim." Both YHWH and Yeshua possess the yuh. In Yochanan 17 the Ruach HaKodesh is silent (does not speak of its own authority). The Ruach HaKodesh is not a person but the spirit of YHWH. HEI -Spirit of Eloah , the ABBA Father, (also known as The speaker - voice that spoke from Heaven the Hidden ONE) understanding Binah, love, Behold, Hinnei. "The Shalom of Elohim which passeth all understanding, shall keep our hearts and minds through Messiah Yeshua (Phil 4:7) The voice that spoke at creation all things came to being; The voice that spoke at Mount Sinai the Torah is given to us; the voice that spoke in the Pillar of cloud He leads the Israel out of Egypt and tabernacle among His people; the voice that spoke at Mikvah of Messiah Yeshua is presented to us as perfect atoning sacrifice, The voice speaks when man doubt the authority of Messiah Yeshua. the voice that spoke through the cloud at Mount of Transfiguration that give us the gleams of Davidic Dynasty - Mashiach Ben David to come (Luke 9:35, Matt 17:5; Mark 9:7); the voice that will speak again on the last days of judgment for those who are not his people, His anger (Revelation 16:18; 21:3-4) The Voice is the ONE who will wipe the tears of the redeemed ones. So many times the VOICE is mention in the scripture did you see any form or semblance of a person? No! VAV / Waw a symbol of connection; a conjunction; the Nail - hook - Mishkan, The one who secures, the Echad; to unite, UNITED ONE, join, union, the vav come in between the two hei which carries the attribute of Hesed through Yesod (foundation) Mercy and truth met together, bring togetherness. 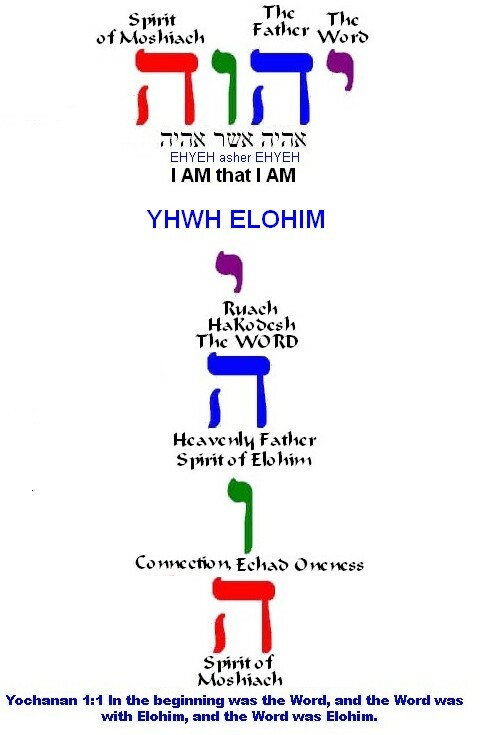 Yochanan 10:30 "I and my Father are ECHAD"
- HEI Spirit of Moshiach; the Redeemer (Yeshayahu 44:6); the living water, the SAR Shalom (Prince of Peace), wonderful counsellor, El Gibbor, the manifested ONE title "the Son", Ben Elohim; bearing the attribute of ; HaMalkut (Kingdom); the light; the shammash; Adonay ; my foundation Yesod, He is our Victory; the Kinsman-Redeemer; Adonay Tzevaot . "For whosoever shall call upon the name of the Adonay shall be saved". (Romans 10:13) He is our expectation, Mikveh, hope, salvation Ro 15:12 Again Yeshayahu says, "THERE SHALL COME THE ROOT OF JESSE, AND HE WHO ARISES TO RULE OVER THE GENTILES, IN HIM SHALL THE GENTILES HOPE." The Yuh is the Living Torah. Ruach HaKodesh since the it teach us the scripture. The same breath that once breath into the nostril of Adam and Hava (Eve) now breath into those who believe in Yeshua, these ones become regenerated, restore the spiritual dead soul back to Almighty, the Word (Torah) writes into the hearts of believer. When the believer has the indwelting of the Holy Spirit (Ruach Ha Kodesh) means the believer has the living Torah. HA AVINU (Father origninator) - "He" is a Spirit (does not have a physical form Deuteronomy 4:12, the Hidden One) (Yochanan 4:24) "He" denote the Masculine attribute in Hebrew understanding. A Spirit is a Spirit but a person has a form comprises body soul and spirit. In 1 Yochanan 5:7 written that...." there are three that bear record in heaven, Ha Avi (Father), Ha Dvar (Ben Elohim - Yeshua), and RuaCH HaKoDeSH (Holy Spirit): and THESE THREE ARE ECHAD dxa (ONE). (the scripture does not say "these three "person" are ONE" DO NOT ADD EXTRA WORD YOURSELF the word "person" IN THE SCRIPTURE that is the error) Yeshua teach us to worship "HiM in Spirit and in truth" (John 4:24) not to view God as a person "in person (form) and in truth" (idolatry concept). YESHUA - YHWH Elohim (Adonay) manifested in the Flesh (has a physical form visible person tabernacle among us) -1 Tim 3:16 and the book of Yochanan describe Him as the BEN ELOHIM (the Son of God) He is both G_d-Man.Also in MattiYahu 3:17 YHWH Elohim declares " And, hinei, a bat kol (a VOICE from heaven) came out of Shomayim, saying, ZEH BNI AHUVI ASHER BO CHAFATZTI (This is my Son, the beloved, with whom I am well pleased)." Also in Dvarim 18:18-19 Almighty spoke to Moshe saying: "I will raise them up a Navi from among their achim, like unto thee, and will put my words in HIS mouth; and HE shall speak unto them all that I shall command him. And it shall come to pass, that whosoever will not listen unto my words which he shall speak bishmi (in My Name), I will require it of him. NOTE: This Moshiach will certainly not speak anything contary to the TORAH. RUACH HAKODESH (Holy breath (wind); Hagios Pneuma, does not have physical form, ) - Speak of His breath, When Yeshua (the Echad at work) appeared unto His Talmidim after resurrection Saying "Shalom Aleihem as my Father hath sent me, even so send I you". "And when He had said this, He breathed on them and said^ to them, "Receive the Ruach HaKodesh." (Yochanan 20:22). They were the first to receive the Ruach HaKodesh even before Shavuot. He is a life sustainer, He teaches, convict a person of sin, regenerated a spirit dead person to become alive in the Messiah, known as Spirit of Moshiach. Yochanan chapter 14-16 explains the work of Ruach HaKodesh. In the later chapter of Yochanan 17:20-23, in Moshiach Yeshua's Kohanim Tefillah (High Priestly prayer). Here we can see the Spirit of ELOAH and the Spirit of Messiah Yeshua in communication, the Ruach HaKodesh is Silent. "However, when He, the Spirit of truth, has come, He will guide you into all truth; for He will not speak on His own authority, but whatever He hears He will speak; and He will tell you things to come. (Yochanan 16:13) Messiah Yeshua emphazied the ECHAD (ONEness) and then the ONEness is manifested in the believer. Most believer do not pay much attention this little word ONE. We who are non-Jews believer in Yeshua never get to know the Echad dxa or ONEness until we get down to study and search in the Hebrew scriptures then with help of the Ruach HaKodesh to understand the ONEness. Truly a better word to use to describe the diety of Almighty is the word Echad dxa given by Almighty you will not go wrong. The word "trinity" (triad) was not found in scripture and it was not use by the early believer in Yeshua until later how they got the idea, I do not know. I do hope this will help the Christian understand why the Jews consider the trinity concept is a form of idolatry. For many centuries christian just follow what was being taught until they have search the Hebrew root word and meaning. If the Lord speak to you to come out of her (Idolatry) would you respond to that call? FAQs: Why the name "Yeshua' is not found in my Bible? Is the name Yeshua found in the Tenakh? For the Non-Jewish believer in Messiah, if you use the translation taken from the Greek you will certainly never find the word Yeshua, in the scripture unless you search the Hebrew lexicon. 3468. yesha', yeh'-shah; or yesha', yay'-shah; from H3467; liberty, deliverance, prosperity:--safety, salvation, saving. 3444. yeshuw'ah, yesh-oo'-aw; fem. pass. part. of H3467; something saved, i.e. (abstr.) deliverance; hence aid, victory, prosperity:--deliverance, health, help (-ing), salvation, save, saving (health), welfare. Both Yochanan 1:1 and B'resheet 1:1 are in a parallel sense. B'resheet 1:1 speaks of the begining of creations while Yochanan emphasizes the incarnate manifestation of YHWH Elohim in the Messiah. Yochanan the forerunner in this verse establishes the preexistence of the Messiah in eternity past. He already "was" when the beginning took place. Messiah Yeshua took upon Himself complete human nature. At His incarnation this is infact YHWH manifest in a form of a man. The word translated "dwelt among us" (eskenosen, Gk. mishkan in Hebrew) means literally "pitched His tent" or "tabernacled among us." Yochanan could therefore speak of hearing, seeing, and touching Him (1 John 1:1ff.). Just as the Hebrew shekinah ("glory"), the bright cloud of God's glorious Person, settled upon the tabernacle (Ex. 24:16; 40:35), even so in the Messiah , YHWH Elohim's glorious Person dwelt among men. Echad dxa seen in Ezekiel 37:17 two sticks are combined to become one (echad dxa ). Turn unto Me, and be ye saved, kol afsei Eretz (all the ends of the Earth): I am EL (G-d), and there is no other [G-d]. in bitterness for him, as one that is in bitterness for his bechor (first born). Avraham is a Picture of YHWH, Avraham is known as "father of a multitude"
Yitz'chak is a Picture of BEN YHWH, Yitz'chak like unto Yeshua went through a "sacrifical" parallel similiarity. The Trinity Defined For the Hebrew, any sort of belief in a triune (three-in-one god) represents a clear step towards idolatry and paganism. The doctrine of the trinity comes from pagan origins, such as Babylon, Greece, Rome, and as the illustration alongside shows, Hinduism.